The Outer Banks of North Carolina is one of the spectacular vacation spots the East Coast has to offer. The barrier islands offer many ways to enjoy your time--whether on land or at the beach. While our bed and breakfast Inn is a wonderful option, sometimes you have a larger group, or want the ability to cook your own meals and spread out through an entire house. We offer a variety of homes with various amenities to fit your vacation needs. All homes are stocked with dishes, cookware, and linens. Of course there's a BBQ grill! Some homes have a hot tub or swimming pool, while others have access to the Nags Head Beach Club. No matter which home you choose, you'll have the vacation of a lifetime. Find our vacation home options here. 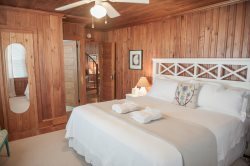 Cypress House Inn Vacation Rentals--Come stay awhile.